Back in 2005, I noticed something that worried me. You may know already that switching Application.Calculation to xlCalculationManual can make various code run faster. It can be a big time saver. The problem, as I see it, is not switching it back to xlCalculationAutomatic. Given that some people for whatever reasons might use Manual Calculation all the time, most people don’t, especially the vast majority of average users who probably haven’t heard of this setting. With Calculation still set to Manual, they might be looking at values that haven’t be updated. Even experienced programmers might be temporarily confused until they figure out what’s going on. Imagine someone in a sales department quoting incorrect pricing to a customer or doing a faulty presentation at an important meeting. Not good. So, how do you know Calculation is set to Manual without specifically checking? Now, imagine sending one of these files to colleagues or customers, then realizing something is amiss days later. Again, not good. In fact, downright scary. So, also in 2005(? ), I made an addin called Calculation Checker. 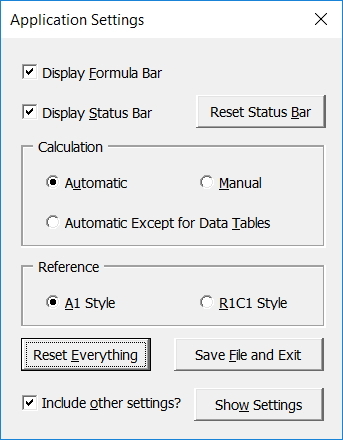 It checks Calculation when you save and prompts you to do so as Automatic if set as otherwise (including Automatic Except for Data Tables). I’ve found it useful, but since then I’ve thought there’s room for improvement, so I made something new. As you can see there’s 3 menu items. The bottom 2, when toggle to “On”, check files when opened/saved for the following settings. Click the form’s controls to reset them individually, or just click the Reset Everything button, then the Save File and Exit button if you choose to. Alternatively, click the X button not to save the file. Note that any other file that are open will also be saved with these settings (unless you change them later), because they are Application settings, not Workbook settings. And because the form can be opened directly from the Ribbon, you can easily change any of the settings at any time for whatever reason. 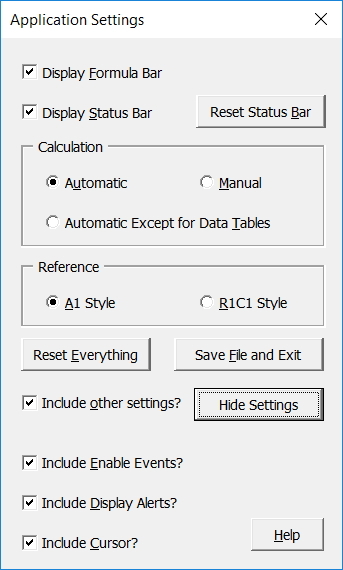 Click the Show Settings button and you can see other settings that can also be reset when clicking the Reset Everything button, if the Include other settings checkbox is ticked. Keep in mind that these additional settings aren’t checked automatically. The form only resets them if you click the Reset Everything button as mentioned above. Also, if Application.EnableEvents is set to False by VBA code, my addin won’t check files when opening or saving as these are the events that trigger it. In fact, you should be setting this False if any of your code does open or save workbooks to prevent my code from running, then set it back to True before the code ends. Hopefully this tool will be of use. You can download it here. PS. I’m going on holidays for a few days so I’ll reply to comments (if there be any!) when I get back. This scheduled routine will always be called even if the VBAproject is reset by whatever reason. The other 2 are used with circular references and also with goal seeks. Having too many iterations or too much precision might mean a really long to converge goal seek on a complex model. Jan, that sounds like good insurance! Care to post an example? Sébastien, thanks for the information. I don’t use those settings (much) myself, but I’ll give some thought to adding them to the next version! ‘Schedule the restore of app settings. As fas as I know Application.Screenupdating and application.displayalerts have only local scope. @snb: You are correct (in theory), but there are bugs and situations where for example Application.screenupdating does not reset itself when the VBAproject is reset. DisplayAlerts is so important that I set it back to True just in case MSFT introduces a new bug that causes it to not automatically reset itself. 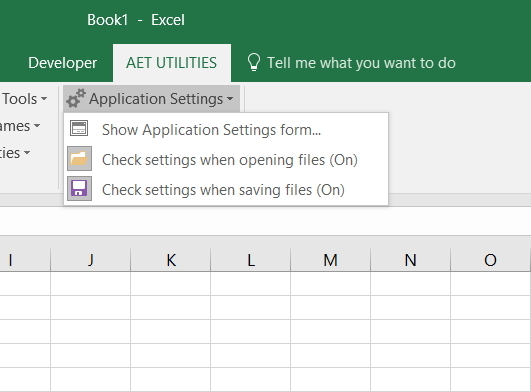 A minor tweak – the macro errors on Show Application Settings Form if a spreadsheet is not open. Just a quick error trap needed. Otherwise I like a lot of the suggestions above. Thanks! I’ll definitely be trying this with future projects! GMF, thanks for picking that up! I’m actually testing a new version right now and will upload it on the weekend with error trapping for no workbooks open. Sorry for any inconvenience. Jake, didn’t think of that… good idea!